Smooth, creamy and indulgent chocolate blended with Organo™ premium coffee to make this decadent specialty coffee treat for everyday enjoyment. 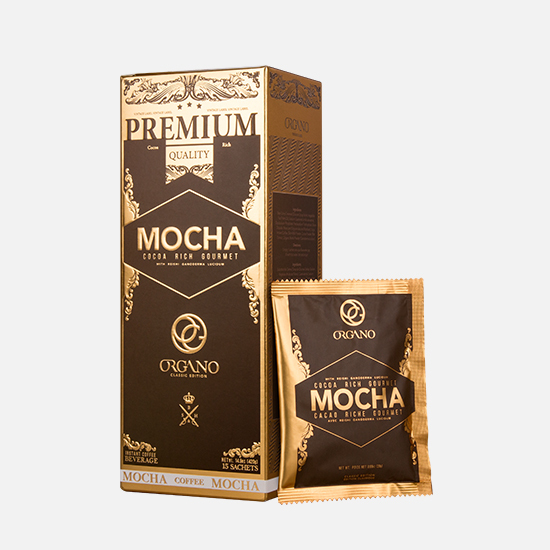 Organo™ Gourmet Cafe Mocha is a delicious specialty coffee drink that combines the rich, smooth flavor of chocolate in a creamy cup of premium coffee, with the added benefits of organic Ganoderma lucidum. Smooth and satisfying, it’s a delicious way to start your day, or have as an after dinner drink or mid-afternoon pick me up. Organo™ Cafe Mocha is a delicious and decadent specialty coffee. It’s a smooth tasting black coffee blended and balanced with a creamer and cocoa powder. 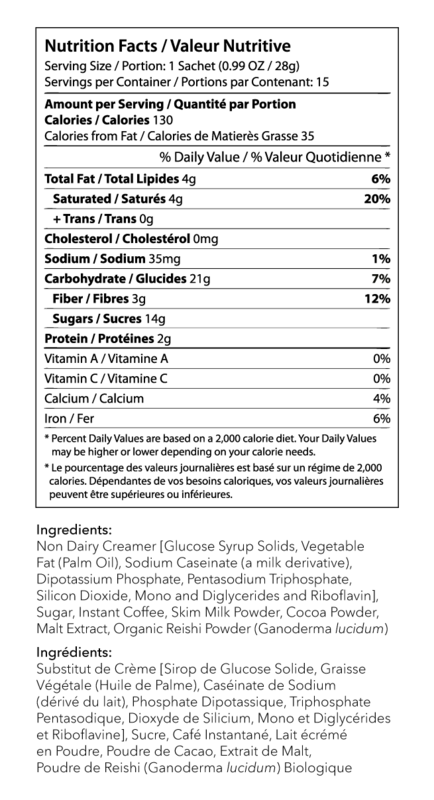 It’s enhanced with a mild, nutty back note of flavor from the amazing Organic Ganoderma lucidum mushroom. Ganoderma mushrooms are ‘adaptogens’ and provide triterpenoids and amino acids. Coffee –instant rich, and full tasting premium coffee is mellowed with the sweetness of creamer and cocoa for a smooth and delicious specialty coffee. Cocoa powder – has a complex flavor to helps emphasize the robust chocolatey notes of the coffee. With naturally occurring polyphenols, and antioxidants that support good health including heart health, brain health, and gut health. Many say chocolate helps create a ‘happiness’ feeling in the body and brain. Non Dairy Creamer – adds a hint of sweetness and creamy flavor to this specialty coffee. Using a non dairy creamer has many benefits. First, it helps provide a lactose free beverage so that even those who are lactose intolerant can enjoy the convenience and flavor. Secondly, it provides a consistent flavor and is shelf stable. Dairy products can have an off flavor, color and odor over time. 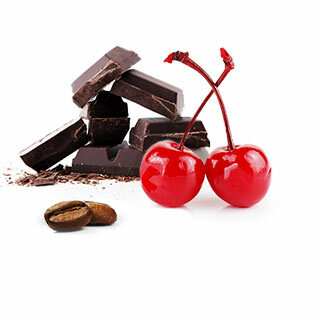 Chocolate contains flavonals, which are a type of plant nutrient found in many foods and drinks, such as tea, red wine, blueberries, apples, pears, cherries, and peanuts. They are particularly abundant in the seeds of the cacao tree—cacao beans. Fermenting, drying, and roasting cacao beans yields cocoa powder, which is used to make chocolate. Flavonals have been studied for many years for their benefits. Theobroma cacao is the scientific Latin name given to the cacao trees which translates to “cacao, food of the gods”. It takes 3 to 5 years before the cocoa tree bears fruit. Each tree produces around 1,000 beans a year. Every stage of cocoa production is done by hand: planting, irrigating, harvesting, fermenting and drying. You can also add ice for a cool specialty coffee treat. 1. Mix ORGANO Cafe Mocha and hot water until disolved. 2. Add cherry juice and stir until mixed. 3. Serve with a dollop of whipped cream, a maraschino cherry and a sprinkle of shaved dark chocolate.